Both Hermione and Draco was excited for the new potions lesson, but Draco was almost running on clouds when he stepped inside the classroom.
" Morning Granger! Wonderful day isn&apos;t it?" Hermione was still half pissed at something, Draco didn&apos;t know why. But he really wanted to find out.
" It&apos;s nice I guess" she mumbled when she sat down behind their desk. 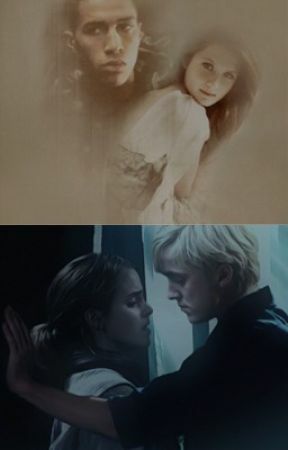 Draco tried to think of something Luna told him, but all she said was that she was in the library all the time and probably he could talk to her there. But he wanted to talk with her like now. Though he could see some dark rings under her eyes, so it wasn&apos;t that awkward question he thought it could be.
" Are you sure? You look very tired" He actually sounded concerned and was willing to help, the question was; would she let him?
" I&apos;m fine" She looked down at her hands or the book, he couldn&apos;t say what.
" 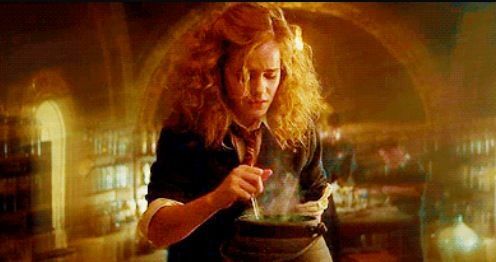 Well, I know how to make a good sleeping-potion, if you want I can...."
" CAN YOU SHUT THE HELL UP I SAID I WAS FINE!!" She screamed outraged and turned red in her whole face. Full of anger. Draco got quiet and didn&apos;t even dare to apologize....or breath.
" Miss Granger I do not accept that languge nor screaming at my lessons!" Slughorn said slightly fractious.
" I&apos;m sorry, sir" Hermione half whispered and stared down at the table.
" 15 point from Gryffindor" the half classroom groaned and sighed. Draco felt very confused, he didn&apos;t know what he had done wrong this time. He just tried to talk to her. They had a short lesson today and it was near the end when they were about to smell the potions.
" Do you want to go first?" Draco said as carefully as he could, who knew? Maybe he had a book thrown in his head if he said it with another tone.
" No, you go" she said quietly. He put his head down in the cauldron and felt exactly what he knew he would smell.
" Did it work?" Hermione wondered and looked at him with curiosity.
" Yeah pretty much. Your turn" he said and backed away from the cauldron. Hermione slowly put her head down and sniffed. He didn&apos;t expect her to say what she felt, but the first seconds she didn&apos;t move an inch. She didn&apos;t made and expression in her face at all. Like she already knew the answer.
" This can&apos;t be right..." She mumbled. Draco was taken aback, and looked at her. " Wait, what? Not right? Of course it is, we got the ingredients and....."
" It&apos;s not that!" She said loudly but she didn&apos;t scream like last time she had everyone&apos;s attention.
" Then what is it?" " Why do you care?! Why do you even care at all? You have never done that before so why start now?" Oh Merlin knows why, he wanted to tell her the truth. He wanted to tell her everything he felt for her, but he just couldn&apos;t.
" I&apos;ve changed" Was all he could say.
" Like I would believe that" She took her stuff and ran out from the classroom and three second later the bell rang. Everyone hurried outside but Draco just stood there. Then he saw a glimpse of it, she had forgot a book. But not just any book.